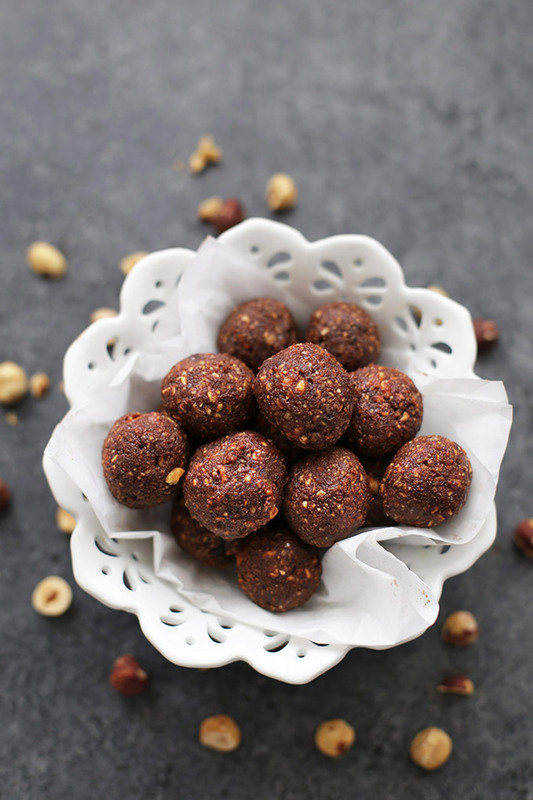 Nutella Energy Bites – These chocolate hazelnut energy bites have that lovely Nutella taste, made from healthy ingredients. The perfect healthy treat! Raise your hand if you love treats? Raise your hand if you want to eat healthfully? Consider both my hands raised. ‘Tis the season of resolutions and healthy eating challenges, and for a lot of us, our sweet tooth didn’t get the memo. 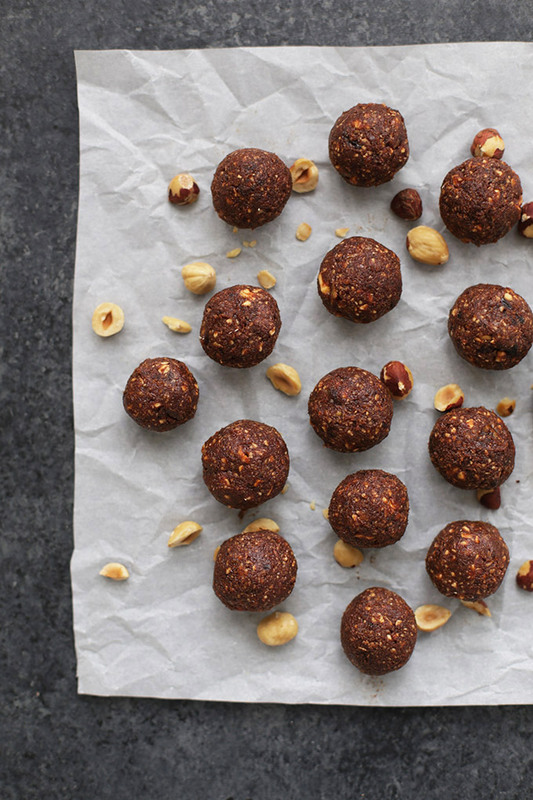 These little Nutella energy bites have you covered. 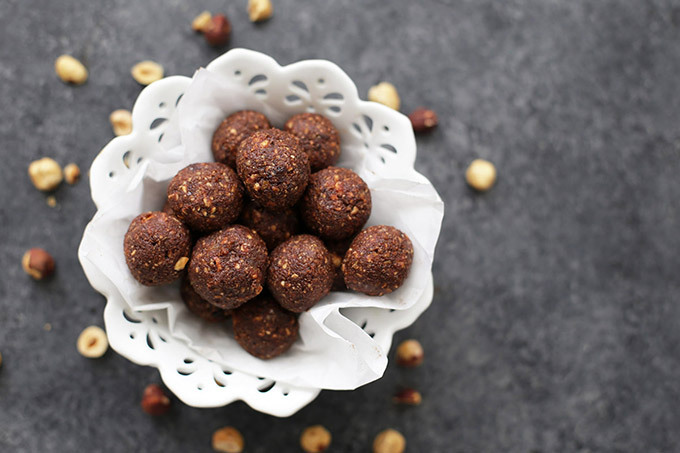 All that lovely, chocolate-hazelnut flavor, but made from healthy ingredients. You won’t find one drop of added sugar in these, but they’ll satisfy your sweet tooth in no time. I’m always looking for ways to say YES when it comes to healthy eating. I don’t want to feel like I’m missing out or not getting to enjoy or live my life because I’ve got hang-ups about food. Instead, I work within the dietary framework we have (gluten and dairy free because of intolerance), and then I work to create recipes that taste GOOD. When I’m craving pizza, I want PIZZA. I don’t want vegetables with beet-laced tomato sauce and vegan pepperoni. I want something that tastes like the real deal. These Nutella bites do that for me. 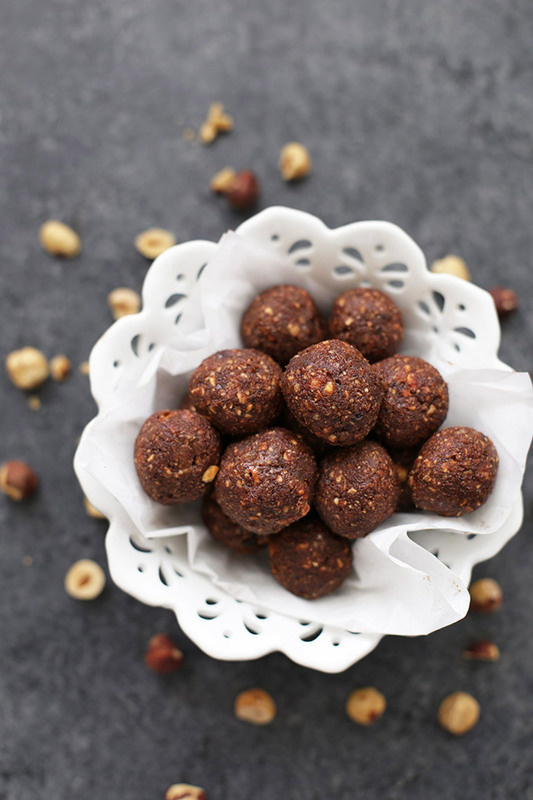 They’re made from a short and sweet ingredient list–hazelnuts, cacao (or cocoa) powder, dates, a drizzle of almond milk, and a pinch of salt. But they’re sweet and satisfying. They taste like Nutella (or, at the very least, our favorite dairy free chocolate hazelnut butter) does to me. You can even lace these with a little collagen if you want to add a small protein boost. I just toss the ingredients in my food processor and let it go to work. Pop the “dough” in the fridge for a few minutes to harden a bit, then roll them out into little bite-sized balls. These are perfect for packing in lunches, pairing with an afternoon snack (with apples, or a bit of turkey), or enjoying at the end of the day when you’re craving something sweet. 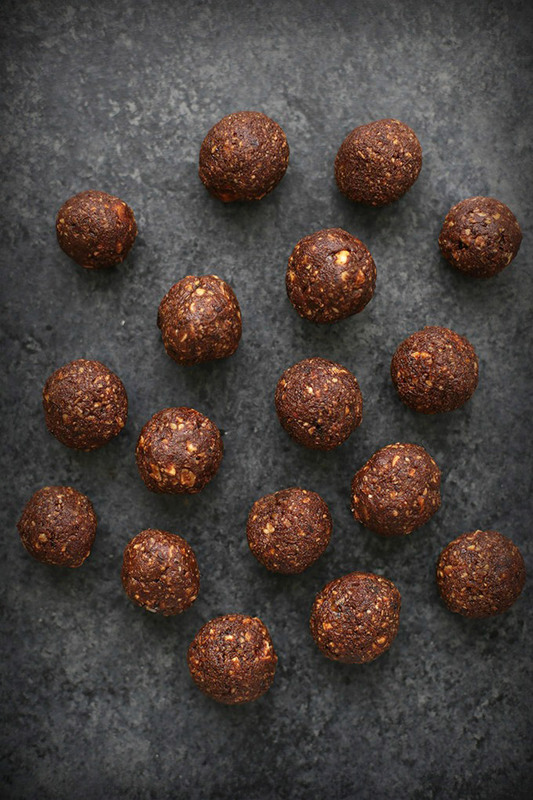 Simple and sweet, these Nutella energy bites help me say YES! Wait and See. Anytime you’re working with dates, you can have a little bit of variation in dryness. If your dates are really dry, you may need a bit more almond milk to help things come together. If yours aren’t very dry, you might not need any. You’re looking for a somewhat sticky (but not wet) dough. Protein Boost. You can add a 1-2 Tbsp of collagen to these without trouble. The only other adjustment is that you may need to add 1 tsp more milk, depending on how dry your dates are. Shelf time. These will keep in an airtight container in the refrigerator up to 1 week, or up to 2 months in the freezer. Toasting Hazelnuts. I buy the pre-roasted ones at Trader Joe’s most of the time (and store them in the freezer to help them last), but to toast your own, I just follow these instructions. Change it up. You can use half almonds and half hazelnuts if you prefer a more mild hazelnut flavor. You can use half dried cherries and half dates for a little more tartness. You can also add in some mini dairy free chocolate chips at the end for a little extra treat. Place dates, hazelnuts, cacao powder, and salt in a food processor. Puree until a big ball of dough forms. (If your dates are dry, you may need to add 1-3 teaspoons of milk to the mixture. Start small, since a little goes a long way). When the mixture is fairly smooth and a big ball, transfer to a bowl and refrigerate 15-30 minutes, or until slightly hardened. Roll out 1-1 1/2″ balls and store in an airtight container in the refrigerator up to 1 week, or in the freezer up to 2 months. Oh, yum, these sound delicious, I’m definitely going to have to give these a try. My five year old would put Nutella on everything if I let her, these look like a great way to satisfy that craving. I’m pretty sure *I* would put Nutella on everything if I could! These look incredible! We’ll have to try them out soon!